It’s time for another mattress battle…this time with two of the titans of the online mattress industry squaring off. In one corner we have the ultra-popular Casper with its cool marketing, sleek design, and head turning price. In the other corner we have Loom and Leaf, spiritual child of established online mattress company Saatva, the Loom and Leaf is packed with high-end materials, a traditional look, and a feel and build quality that is every bit as good as Tempur-pedic. But there can only be one who will take home mattress glory…continue reading to find out who’s the victor between Loom and Leaf and Casper mattress! 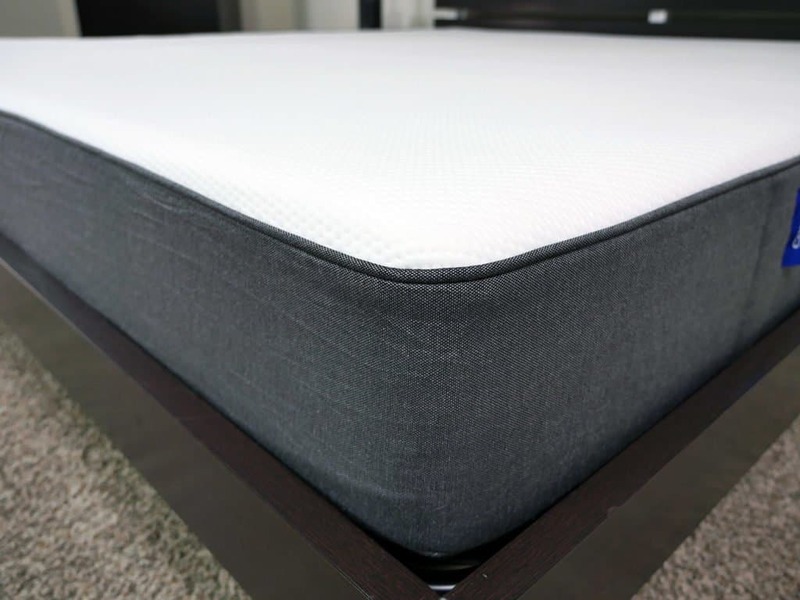 The Loom and Leaf mattress is a 12″ luxury foam mattress. It’s been designed to provide exceptional cooling, deep compression support, and balanced comfort. Perhaps the greatest distinction between Loom and Leaf and Casper is simply that it’s not compressed in a box. The Loom and Leaf ships via full service in-home delivery. This means they will set the mattress up on your frame, take your old mattress away (if needed; for an extra fee), and can deliver your foundation also. Loom and Leaf is built from 4 different layers of foam. It has a total thickness of 12″, which gives it a slightly larger profile than many other online mattresses (this also improves the deep compression support, more on that in a bit though). Top layer (comfort + cooling) – the top layer is 2.0″ of conforming gel foam. Gel beads in the foam help to absorb heat from the sleeping surface, improving the cooling of the mattress at large. The gel is swirled into the foam during the formation process, this helps to ensure the gel penetrates the entirety of the foam for even distribution. The gel swirl foam is nice, but what really makes the top layer incredible is the lamented spinal cooling pad. The cooling pad is affixed to the top of the gel foam layer. This is the same type of cooling pad that is used in burn wards and hospitals, as such it has to perform under the most critical of circumstances and adds an impressive level of cooling to the mattress. Second layer (contour) – this layer is 2.5″ of memory foam. This is a 5 PCF (pounds per cubic foot) density foam that makes up much of the core of the mattress. It provides great comfort, contour, and pressure relief. Third layer (transitional support) – this is a 2.0″ transitional support layer that helps the foundational foams work with the above foam layers. Additionally, it helps to provide improved deep compression support. This allows the mattress to offer a consistent level of support for both large and small sleepers. Bottom layer (foundation) – this is a 5.5″ high-density support foam. It acts as the foundational base for the mattress, providing shape and a good base layer. The cover of the Loom & Leaf mattress is made from 100% organic cotton. Cotton gives the cover a classic look and makes it highly breathable (which helps keep the mattress cooler). Quilted within the cover is a thin piece of foam (5/8″). This foam combined with the cotton cover gives the mattress a traditional soft feel. When you immediately lay on the mattress you’ll feel the initial softness of the quilted cover as the foams begin to engage. In addition, the cover is woven using natural thistle. Thistle acts as a natural organic flame retardant, as opposed to a chemically treated flame retardant or fire sock. It’s a very nice extra that I haven’t seen in any other mattress I’ve tested (except Loom & Leaf’s sister company, Saatva). Aesthetically, the Loom and Leaf has a luxurious look and feel. The cover is trimmed with gold thread along the perimeter, which gives it a high-end look. The Loom and Leaf mattress has a medium firmness (called the Loom & Leaf Relaxed Firm) at a 6 out of 10 on the firmness scale (where 10 is the most firm). If you prefer a firmer feel, the Loom & Leaf is also available in a firmer option (called the Loom & Leaf Firm), at an 8 out of 10 on the firmness scale. 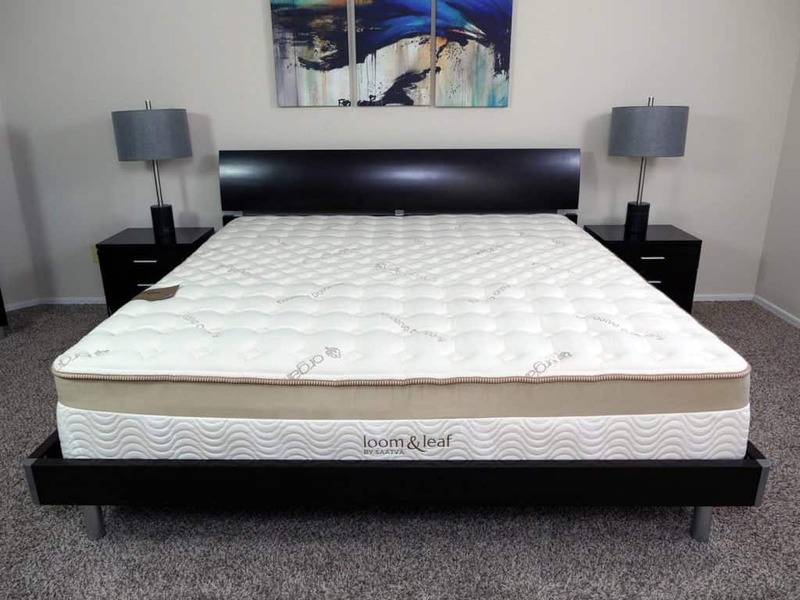 Loom and Leaf has a luxury look and feel on par with Tempur-pedic. From the foam materials used, aesthetic style touches, and manufacturing quality, the mattress has a solid build quality that is evident from the first night. Many online mattress companies try to create a universal feel; a mattress that has an ideal balance of comfort, support, and cooling suitable for the vast majority of sleepers. Of all the companies trying to hit this universal feel I think the Loom & Leaf is among the best mattresses that really hit the nail on the head. 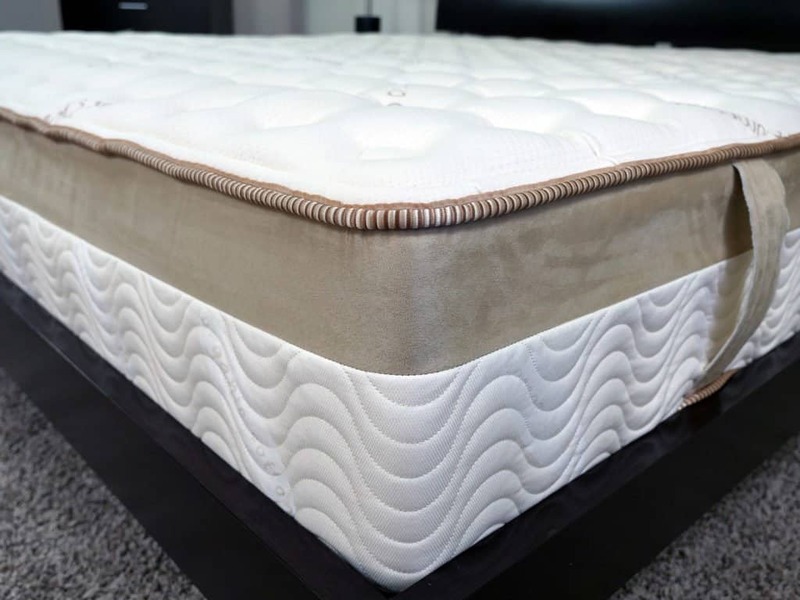 The Loom and Leaf allows the sleeper to sink 2.5-3.5″ into the mattress, providing great pressure relief and notable level of contour, created by the layers of memory foam. Additionally, the Loom and Leaf is fairly responsive, especially compared to more traditional memory foams. This means it can quickly change and adapt to changes in your movements. This also helps to ensure continual and consistent contouring support, while avoiding the “stuck” quick-sand like feeling. The material construction of the Loom and Leaf is equally impressive…organic cotton, plant-based foams, natural thistle flame retardant, good foam densities, spinal cooling gel, and 6.5″ of comfort foam. The Loom and Leaf has really gone above and beyond with their material selection. No corners are cut. They use the best materials and it delivers an exceptional mattress. In terms of support the Loom and Leaf does a very good job. This especially extends to deep compression support. 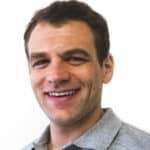 This is particularly important if you’re a heavier sleeper (really anything over 180 pounds). The Loom and Leaf does a good job of maintaining consistent support even under heavier pressures. The thicker mattress profile helps to maintain this level of support even for heavier sleepers. For more information please see my full Loom and Leaf mattress review. The Casper is a 9.5″ all foam hybrid mattress. Hybrid mattresses use different layers of foam (or other materials) to achieve an optimal level of comfort, support, and cooling. The Casper is built from 4 different layers of foam. Top layer (poly foam) – The top layer is 1.5″ of responsive poly foam. The responsive poly foam is designed to offer great comfort, bounce, and cooling. Second layer (memory foam) – The second layer is 1.5″ of memory foam. Memory foam provides support and pressure relief for the mattress. It’s placement below the responsive poly foam helps to eliminate any potential heat retention issues. 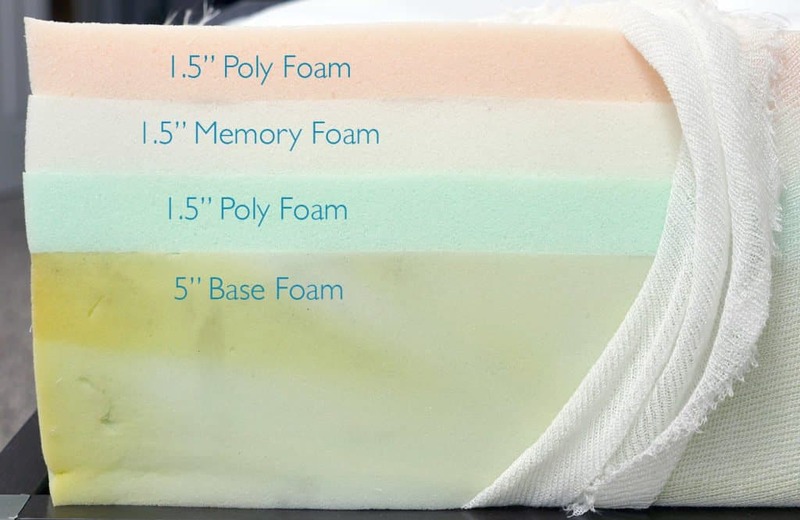 Third layer (support foam) – This third layer of poly foam is designed to act as a transitional layer between the above comfort foams and base layer. Bottom layer (foundation) – The bottom layer of the Casper is 5″ of high-density support foam. This is a basic foam that acts as a foundational base for the mattress. The Casper is a classic hybrid designed foam mattress. 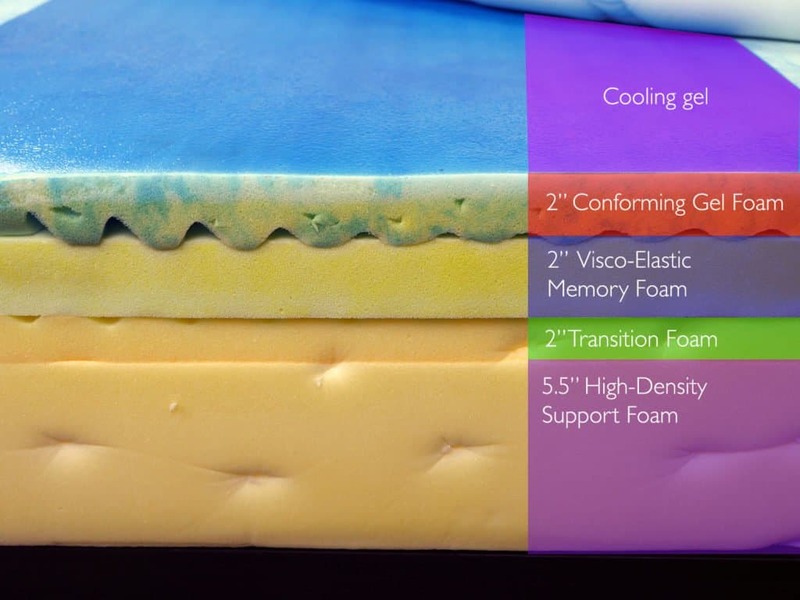 Hybrid mattresses utilize different layers of foam (or other materials) to maximize certain benefits, while minimizing other negative attributes. In Casper’s case they have chosen to layer responsive poly foam on top of memory foam. Using the responsive poly foam layer on top ensures the sleeping surface stays cool, has a nice bounce, and good comfort. 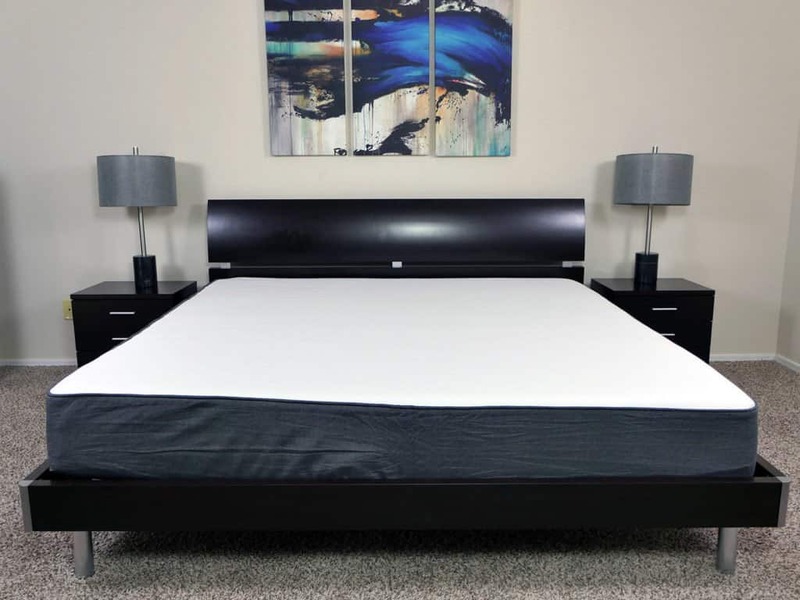 Additionally, by placing the memory foam in the middle of the mattress the Casper is able to have good support and pressure relief, but also reduce any heat retention issues that could otherwise arise from the memory foam (memory foams have a tendency to sleep hotter than other foams). Casper’s cover is a two-toned design. The white piece of fabric on top is imported from Belgium. It has a soft feel, good stretch, and is quite porous (note the knit in the image below). The porousness helps the cover and mattress breath better, by allowing for easier airflow. The white fabric on top helps aid cooling and is quite soft. The grey piece of fabric that runs along the perimeter is sturdier, which does help to reinforce the edges against possible damage. Aesthetically, the Casper has a modern look to it. The two-tone grey and white design gives it a nice contrast that looks sharp in any room. Casper strikes a medium firmness at a 6-7 out of 10 on the firmness scale (where 10 is the most firm). I give Casper a bit of a firmness range due to anecdotal evidence I’ve received from many of my readers. Lighter sleepers (less than 180 pounds) seem to experience the Casper in a slightly softer feel, at a 6 out of 10 (myself included). This is in contrast to heavier sleepers (180 pounds or more), which experience a firmer feel, closer to that 7 out of 10. I believe this is due to the Casper’s 3″ of comfort foam. Heavier sleepers put increased pressure on these foams, which allow the sleeper to sink into the deeper layers of the mattress, which have a firmer feel. With regards to overall support, I think the Casper is fairly average. For sleepers that are an average weight, you will probably be fine. However, for heavier sleepers the deep compression support is a bit lacking. This is simply due to sinking deeper into the foams, engaging more notably with the transitional poly foam and base poly foam layers. Casper does a good job keeping the mattress cool. The hybrid design with the poly foam layer on top and an extra porous fabric atop the cover helps to maintain a cooler sleeping surface. When lying on the Casper in a back sleeping position I experienced about 2.5″ of sinkage and 3.5″ on my side. Casper offers deeper sinkage and the hug feels more pronounced. The top poly foam layer is quite soft, which allows the mattress to substantially hug and envelope the sleeper. It’s still quite responsive, so I wouldn’t say this envelopment causes me to feel “stuck”. It’s an interesting phenomenon. The top poly foam is quite soft, which allows the deeper hug, while at the same time providing slightly less in terms of body contour. IE, you sink into the layers, but they don’t as sharply contour like 100% memory foam would. 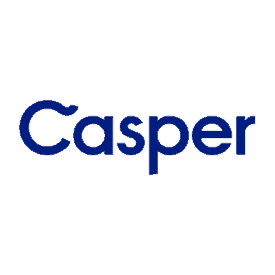 For more information please see my full Casper mattress review.